It seems that at the moment the shipping process of the first dev kits of the Oculus Rift is a bit of a mess. The team at Oculus started shipping the first units already, but it seemed that they were only shipping to US/Canada with the international orders expected to start shipping a bit later on. My order number was 142 and the online system still says my order is being processed for shipping and I just got back from the customs after clearing my Oculus Rift dev kit. It has been shipped on 28th of March and arrived yesterday wit UPS and I’m based in Europe. Now I’m off to trying the kit out and you can expect my first impressions a bit later, I’ll also publish additional information when and where you would be able to try out dev kit if you are interested in it and happen to be living or passing by Sofia, Bulgaria. 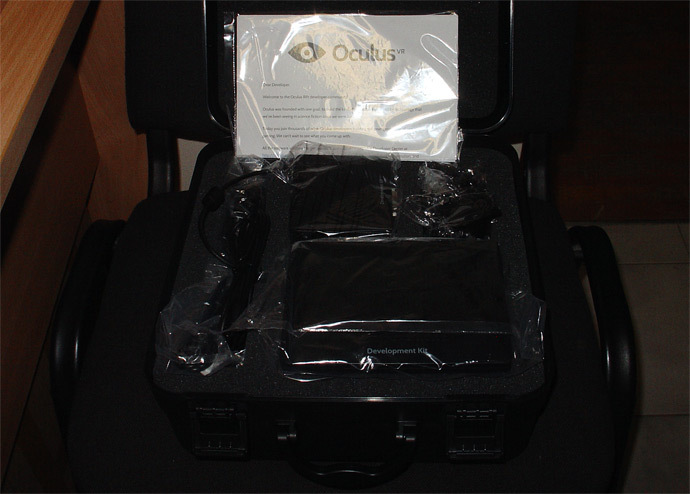 The good news is that the first batch of Oculus Rift developer kits may finally start shipping to Kickstarter backers this Monday, the not so good news is that there will not be a Doom 3 BFG Edition copy supporting the Rift bundled as it was previously announced. The reason for that is that DOOM 3 BFG Edition will not support the Rift development kit by the time the kits begin shipping. So instead the team at Oculus is offering a few alternative options in the form of replacement awards instead of DOOM 3 BFG. – $20 Steam Wallet credit, perfect for buying your next game on Steam (including DOOM 3 BFG Edition without Rift developer kit support if you still want it). – $25 Oculus Store credit, which can be applied to future purchases at the Oculus Store including Oculus Latency Testers, new Oculus t-shirts, and more Rift development kits. – A full refund for your pledge. You’ll need to choose your new reward by logging into the Oculus Order Manager. Codes for the replacement rewards will be delivered in April. You’ll default to the Oculus Store credit if you don’t make a selection by April 5. Also while in the ORder Manager make sure you have an up to date address for delivery and change it if needed. Now, since Doom 3 BFG Edition with Rift support probably will not be ready by the time the dev kits start reaching people the question what you will test the device with arises. The Oculus team suggests that the game Hawken might be ready with support for the Rift by that time, but we’ll see. Hopefully along with the Dev Kits we are also going to get access to the SDK, so even without games out to support it we could start playing with the device, though there was not word about that in the latest update. 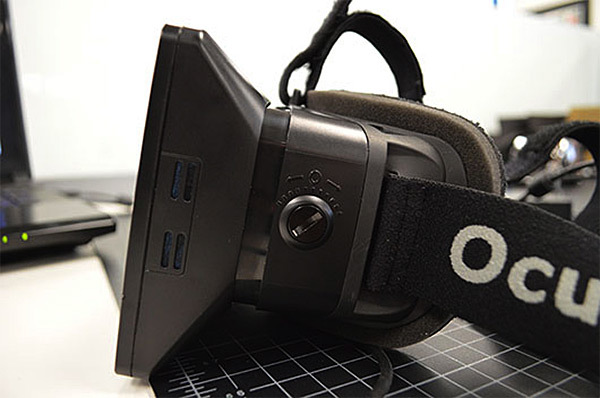 Some good news for everyone that is expecting their Oculus Rift developer kit like me. The team at Oculus has shared some interesting information about final units and their production and has confirmed that they have finished the first pilot run at the factory for 40 complete units and are on track for starting the mass production by plan and have Oculus Rit dev kits start shipping in March. Hopefully there will be no extra delays caused by the upcoming Chinese New Year that starts in a few days. The delay that has moved the initially announced November/December 2012 release to March this year caused by the need to change the display used in the Rift has apparently also allowed the team at Oclulus to implement some new and interesting features in the final dev kits of the device and now that is is already finalized and in production they have shared more details about these as well. One of the more serious concerns about the device was that it may not be suitable for people wearing contact lenses or prescription glasses, something that has been a bit of a problem for pretty much all consumer-oriented HMD devices we’ve seen so far becoming available on the market. It is not an easy task to properly block the external light and allow for the use of glasses and compromising with any of these can lead to compromises with the experience and when you are designing a device intended for better immersion such compromises are not a good idea. It is a fact that our eyes are not able to focus properly at objects very close to them, so that is why HMD devices have to use optics to allow our eyes to be able to properly focus on the displays inside them. And if you are having problems with your vision as many of us do nowadays you need to wear contact lenses or prescription glasses in order to be able to properly see the image produced by an HMD device such as the Rift. 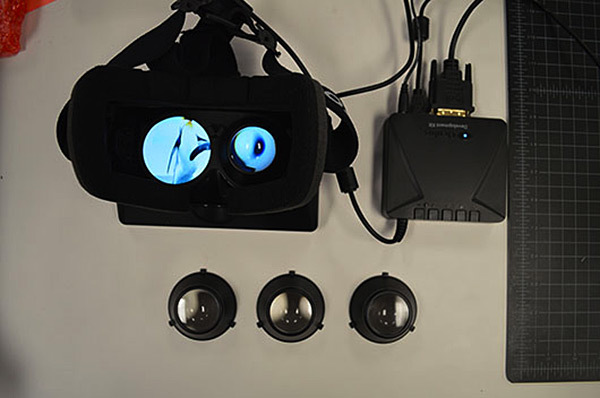 The initial prototype of the Oculus Rift did not directly address the needs of people that wear contact lenses or prescription glasses, but the extra time that the team at Oclulus had due to the screen delay has allowed them to work on that issue. So the final dev kits will come with three pairs of removable eyecups, instead of just a single, permanent set. The different eyecups should allow to switch the focal distance of the developer kit between three predefined settings, so if you are nearsighted and your vision isn’t too bad, you may be able to use the developer kit without glasses or contacts. – If you have normal vision (20/20 or 6/6 vision) or you wear contacts, your vision inside the Rift will match your vision in real life. You’ll have to use eyecup set A. – If you’re farsighted, you’ll have no visual problems in the Rift because the optics are focused at infinity (which makes your brain think it’s looking at something far away). You’ll also have to use set A. – If you’re nearsighted, the additional eyecups, B and C, should allow you to see inside the Rift as if you were wearing glasses. Again, this is because the lens cups change the focal distance. If you’re moderately nearsighted, you’ll have to use set B. If you’re very nearsighted, you’ll have to use set C.
Unfortunately there is no word yet what diopter ranges are the sets B and C going to cover, so it is hard to know if these will work for you or not and even if they work how well will they do. And while this solution is not perfect, it is better than nothing. The interchangeable eye cups with different lenses will be suitable only for nearsighted people, if you have other issues with your eyes such as astigmatism these will not help you. There however is another thing that may allow you to use the device with the standard eyecup set and your prescription glasses, this is the Adjustable Assembly solution – a geared mechanism that should allow you to extend and retract the assembly that holds the screen and the eyecups to position it comfortably. This means that you will be able to extend the assembly to provide extra clearance for glasses or a larger brow, though the size of the prescription glasses would probably matter much and you will be able to fit only smaller ones, though this could also lead to reduction of the FOV you get. If however you don’t need to wear glasses or need extra space you should be able to retract the assembly, bringing the lenses closer to your eyes, and thus increasing the field of view you will be getting. 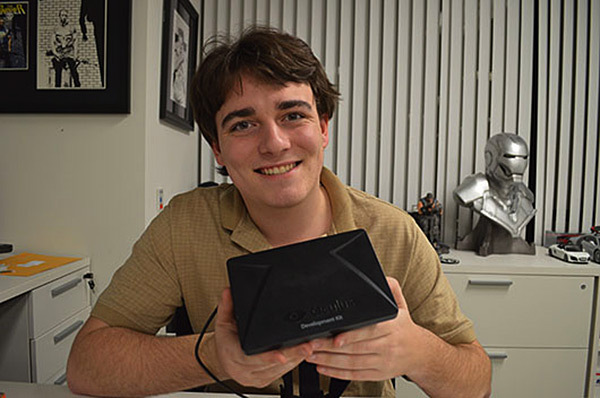 If you have missed to join the effort in Kickstarter, you are still able to pre-order the Oculus Rift developer kit at the official website for $300 USD with estimated shipping date currently set for April 2013. Have in mind that this is for the same dev kit that everyone else will receive in March. The consumer version is apparently being worked on, but we are probably not going to be seeing it anytime this year, as developers will also need some time to implement support for the Rift in various games and applications, as currently there are only a few already announced.